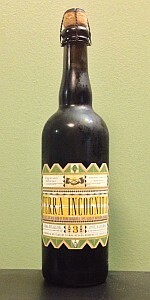 Sierra Nevada / Boulevard Terra Incognita | Sierra Nevada Brewing Co.
Terra Incognita’s third rendition features complex and earthy malt flavors enhanced by a masterful blend of character from barrel aging in both red wine and bourbon barrels that add notes of tart fruit, vanilla, and coconut. The 2014 edition does not include the wild yeast Brettanomyces. It is a 55% blend of wine barrel ale, 32% bourbon barrel aged ale, and 13% fresh ale. The base beer is a hoppy, imperial brown ale. Original rating May 27. 2017- 750 ml bottle, forgot about this in my fridge, approximately 2 years old- Pours dark hazy brown with a small tan head that reduces to a thin blanket. Aroma is cocoa, toffee, spices, coconut, wood, a bit of funk. The taste is oak barrel, coconut, toffee, chocolate, alcohol is noticeable yet in check. Not bad, a bit on the malty side for my tastes. My neighbor and I found a bottle of this down in Champaign IL. It poured an opaque brown with ecru head that is not leaving any lace. The scent had hints of dark fruit and bourbon. The taste is very complex there is hints of plum, anise and bourbon. The Mouthfeel is fuller in body with smooth carbonation. Overall it's a solid beer and certainly worth a try. Appearance - Pours dirt brown with a dark khaki colored finger width head. Fair retention, then dies down to to a thin, consistent film across the top. Not much lacing. Just a few spots here and there. Smell - Some vinous red fruit, but it's pretty light. Faint brown sugar and a touch of earth. Taste - Mostly semi-sweet, with damp notes of red wine fruit, molasses, subtle leather and oak bourbon qualities, and a hint of chocolate. Fairly straight profile from start to finish, with faint blackberry tartness left on the tongue. Mouthfeel - Medium-bodied with low carbonation. Slick texture gives way to a mostly dry finish. Overall - Some might call this bland, but this beer finds its niche in its subtle qualities. You find all three levels of brown ale, wine and bourbon character at some point. That said, it certainly lacks a definitive quality; everything just seems to lay flat, and thus we've come full circle. This beer, despite its tame complexity flavors, is pretty bland. "Situated at opposite ends of the California Trail, pioneering breweries Sierra Nevada and Boulevard have embarked on a brewing adventure into the unknown for the third time. Terra - meaning "earth" speaks in the nature of beer with its rich, earthy malt flavor. Incognita - meaning "unknown" - is the transformative process of barrel aging and blending to create a finished beer much different from the original sum of its parts. The result is an incredibly complex collaboration that defies common beer styles." Brewed in the style of an American Strong Ale, available in 750ml. bottles and on limited draft. Poured from a 750 ml. bottle to a tulip glass. Appearance: nice art work on the bottle. The bork was a bit short and didn't give much of a pop when I opened it. The beer pours a dark brown color and has good clarity. The head is a light tan with medium sized bubbles. The viscosity looks medium to light. Nose: wood, barrel character, oak, coconut, marshmallow, vanilla, red wine, a bit tannic, slight oxidation on the nose but it's only minor and compliments the smell. I could use more American (Imperial) Brown Ale in there considering it is the base beer. Taste: very smooth and luscious, medium carbonation, cherry, oaky, very barrel forward, tannins up front from the wine barrels (and the wine presumably), reminds me a bit of Victory Red Thunder (Baltic Porter aged in Red wine barrels; but without the chocolate and coffee notes), dark fruits and very little bourbon barrel character except for a bit of vanilla in the finish. Overall: What a nice beer. Sometimes barrel aged dark beers can be so aggressively barrel but this one is graceful and very refined. The red wine really adds to the complexity of this beer and compliments the brown ale base. I would like more America Brown Ale character. It seems like the base beer was an English brown ale and not American but who knows. It is still a damn good beer and the year and a half in my cellar hasn't ruined it at all. I'd buy this again and look forward to trying the next versions. Corked and caged 750ml bottle poured into a snifter. The description of the beer sounds really appealing so I have been looking forward to trying this. Overall, you can get notes of both barrels (particularly the wine barrels). I would have liked a little more of a malt backbone behind this with a little more sweetness. As it is, it is a little hot at this point from the alcohol. It may benefit from a year or two in the cellar. Sierra Nevada / Boulevard Terra Incognita from Sierra Nevada Brewing Co.